The Phelps County Historical Society (PCHS) is located in the county seat of Rolla, Missouri. It was organized in 1939 and incorporated in 1940. 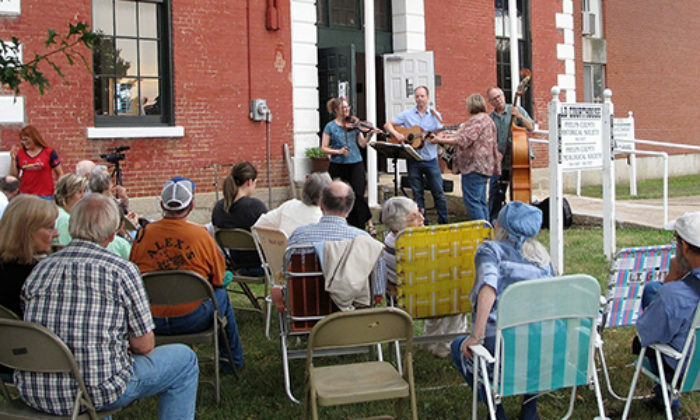 The Society’s mission is to preserve and showcase the history of Phelps County. The PCHS does this through the exhibition and interpretation of artifacts, architecture, programming, and publications. The Society covers the history of all of Phelps County including the incorporated towns of Rolla, St. James, Doolittle, Edgar Springs, and Newburg. The Society began the publication of a newsletter in 1982, in order to better disseminate information on the society and about the history of Phelps County. The Society officially gained non-profit tax-deductible status in 1986. It is a membership-based organization that is led by a volunteer executive committee elected at each fall meeting of the members. The Society currently owns and maintains the Old Phelps County Courthouse completed in 1861, the 1838 Dillon Log House, and the 1860 Limestone Block Jail. The original jail and courthouse are listed on the National Register of Historic Places. Phelps County was incorporated in 1857, but a county seat was not selected until a few years later. Rolla was established in 1858, made the county seat in 1861, and officially incorporated in 1890. The construction of the first jail began in late 1860, followed by the start of the county courthouse that was nearly complete by the time the Civil War broke out. The railroad arrived in Rolla, right at the courthouse steps in 1860, making Rolla a strategic location during the war, in which the courthouse played a major role. In 1994, the Old Courthouse Preservation Committee (OCPC) assumed ownership of the building after the county completed construction on the new courthouse located adjacent to the Old Courthouse. The OCPC and the PCHS worked together to raise money and restore the courthouse to its 19th-century appearance, which included installing a new cupola to match the original one that was removed in the 1950s. After the completion of the cupola project in 2010, the OCPC was assimilated into the PCHS and the courthouse came under the stewardship of the Society. The Dillon log house was built in 1838, by Levi. L. Snelson. It later became the home of John Dillon and was originally located six miles east of Rolla. The log house was the site of the first county circuit court meeting. The house was moved to its current location across from the Old Phelps County Courthouse on Third street the 1960s and has served as the Phelps County museum since that time. The museum currently houses many artifacts that detail the history of Phelps County and its people. The museum is open on Friday mornings and by appointment for groups to tour. The Dillon house received some needed landscaping in Spring 2018 thanks to the Rolla Floriculture Club who donated their and time and materials to clean out and redo the flower beds around the log house. The Society is an all-volunteer operated organization. 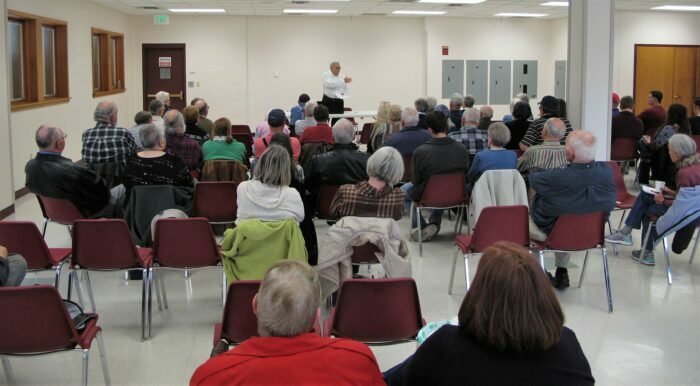 Annual meetings are held every October with an additional public meeting held in the spring. The meetings include a speaker and business meeting. This past year the PCHS hosted Jim Thole at the October 8, 2017 meeting. He talked about Route 66 and the lasting legacy of its neon signage. Dr. Mark Stauter was re-elected as the PCHS president. Melody Warner (treasurer), Debra Griffith (secretary), Katie Seale (curator), and Dennis Peterman (Vice-president) filled the other officer positions. Diana Watkins and Larry Roberts were elected to the as at large members of the executive committee. The executive committee meets at least once a month to discuss maintenance projects, plan upcoming events and explore grant applications. The spring meeting took place in April 2018. It opened with the reading of the minutes from the most recent executive committee meeting followed by the second part of Lynn Morrow’s presentation, “The Blands and Lenoxes: A Tale of Missouri Reconstruction.” This portion of his talk covered the history of these families from the end of the Civil War through reconstruction. The first portion of his talk was hosted by the Phelps County Genealogical Society a month prior. Other annual activities of the Society include the celebration of Edmund Ward Bishop’s birthday in July and An Old Courthouse Christmas during the winter holidays. Edmund Ward Bishop was the founder of the town of Rolla. This year was Bishop’s 198th birthday and was celebrated with live bluegrass music, provided by Flint Holler, cake, and ice cream. This past year the Society also held two rummage sales, April 14, 2018, and June 2, 2018, of donated items to raise money for repairs and maintenance of the courthouse and log cabin. The next project the PCHS is undertaking in maintaining the Old Courthouse is the repair and replacement of damaged portions of the cupola. 1 – Flint Holler band playing at the celebration of Edmund Ward Bishop’s birthday on the courthouse lawn, July 2018. 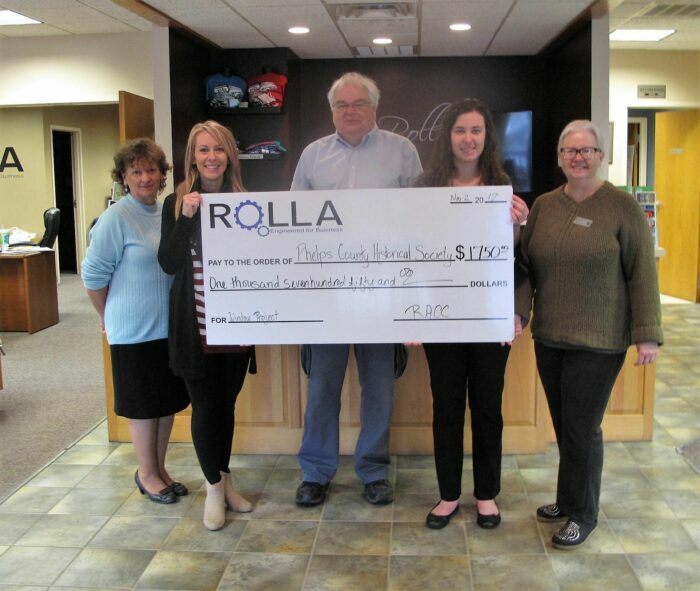 2 – Phelps County Historical Society Executive committee receiving donation from the Rolla Area Chamber of Commerce for replacing windows on the courthouse. Pictured left to right: Melody Warner, Aimee Campbell (RACC), Mark Stauter, Katie Seale, Debi Griffith, November 2017. 3 – Spring annual meeting, Lynn Morrow speaks on “the Bland and Lenoxes: A Tale of Missouri Reconstruction,” April 2018.